Sit atop the city landscape in the Nissan Qashqai. This dynamic crossover gives you a wide view from its stylish design as you command attention around every turn. Filled with all of the technological utility of Nissan Intelligent Mobility, this is an SUV made for the city streets. From premium interior design elements to connective driver aides that introduce a new level of safe driving, the Qashqai puts you in control at every step of your drive. 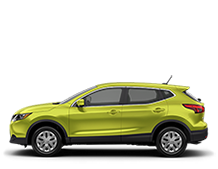 At West End Nissan, your choice Edmonton Nissan dealer, explore all that the Nissan Qashqai provides. The 2019 Nissan Qashqai is designed with the utmost in luxury and the height of engaging connective technology. Settle into the leather-appointed seats with ease and enjoy the legroom, especially in the driver’s seat due to the D-shaped sport steering wheel. Adjust to the elements with heated front seats, and gaze upon baby blue skies with the power moonroof. Let the Qashqai’s technology guide you on your next drive, with Intelligent Cruise Control, Intelligent All-Wheel Drive and ProPILOT Assist™. And that’s just scratching the surface of the connective mobility in the Qashqai, transforming itself into a reactive partner when you work in concert with it. 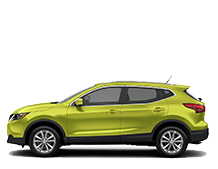 A supremely designed technological marvel, the Qashqai puts you in control on urban streets. For 2019, one of the biggest additions to the Qashqai was the ProPILOT Assist™ technology system, giving drivers assistance in maintaining proper vehicle distance on roads and adjusting acceleration and braking in accordance with the traffic environment. The Safety Shield 360 technology has also been added, which includes lane departure warning, rear cross traffic alert, emergency braking and more. As evidenced throughout, the Qashqai is a crossover that puts technology at the forefront and always works to get the best features over any model year. Come to West End Nissan for your choice of Nissan vehicles. Our sales, service and parts departments will ensure you get the best quality assistance.